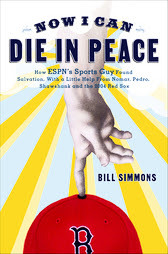 Read Now I Can Die in Peace by the great Bill Simmons. Buy it, borrow it, steal it, download it. Do whatever you must to get your hands on this wonderful, riotous jewel of American sports literature. I'm only 70 pages into it, and it's already the most entertaining book I've ever read. And I'm not even a Sox fan. I can't believe I put off buying it for two years. If you don't laugh out loud at least once at each editorial within this book, you might want to get your head checked. Funny, critical, informative, candid, and an absolute must-have for any sports fan. I've got the 2007 ESPN Pro Football Almanac en route from the great folks over at Amazon. I'm not going to have a life for the next five months, I swear.